About Us - Greenbaum P.C. Hello! My name is Eric Greenbaum. 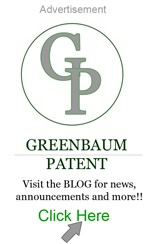 I’m a patent attorney and a scientist with a particular fondness for helping independent inventors and startups protect their inventions and other IP. I started Greenbaum P.C. to make intellectual property law more accessible to individuals and companies without multi-million dollar legal budgets. Like it or not, intellectual property is an intimate part of doing business in today’s economy and I wanted to create a place for small companies and individuals to get quality counsel at reasonable rates.